DSP in active speakers is not a new thing, but arguably until recently, it is not a technology that has realised its full potential. This was proved convincingly by the Kii Three that I wrote about in issue 162: a compact active digital design that combats room problems with a clever bass-cancellation system. So when I heard about Dutch & Dutch’s similarly DSP-driven design the 8c I was certainly interested, a lot more perhaps that would have been the case BK (Before Kii). And that’s not all that’s interesting about this model, as the technology behind the driver array – there are two bass units in the back of the box and a shallow, yet wide waveguide on the tweeter – is based on research done by Harry F Olson at RCA Labs in the early 1970s. Olson was trying to create a loudspeaker that mimics the behaviour of a cardioid microphone. That is a speaker that produces a cardioid dispersion pattern to minimise the effect of reflections from room boundaries. It’s the sort of thing that is very hard to create using trial and error but, with the computer modelling that Dutch & Dutch uses, becomes a whole lot more do-able. Dutch & Dutch manages to achieve around 20dB of rearward rejection, compared to 10dB of its main rivals. 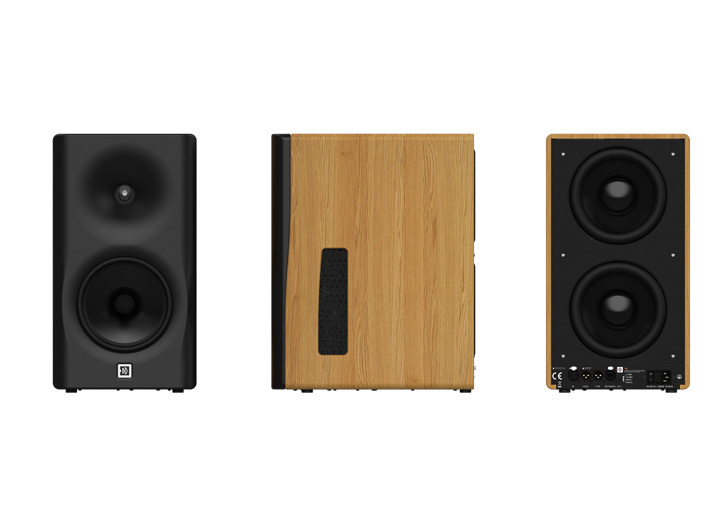 The first speakers that the company built were for the pro audio market under the Pro Fidelity System brand, but when this led to the 8c they decided to develop a speaker for home users. The way that the Dutch & Dutch 8c uses the rear wall is inspired by Roy Allison’s work at Acoustic Research and especially the work performed by Dr Floyd Toole and Sean Olive at the National Research Council of Canada (and later for Harman Audio) in the 1990s. This approach integrates the room into the way the sound projects rather than trying to minimise it by placing speakers away from walls. Dutch & Dutch recommends you place this fairly substantial stand-mount between 10-50cm away from the rear wall, which seems very close and even more so when you see that there are two decent size bass units in the back. The cardioid element is provided by the way that the midrange driver’s rearward output is radiated through vents in either side of the box in anti-phase, the idea being that when the signal from the front of the driver turns the corner it is acoustically cancelled out. You can see why this technology required several generations of engineers to achieve when you consider just how radical this idea is. Inside the solid oak cabinet of the 8c is 1000 Watts of power for the drivers which breaks down to 250W apiece for tweeter and midrange and 500W across the two bass drivers. The latter are eight-inch metal cone types that inhabit a sealed part of the cabinet and sit above a connection array that allows for balanced analogue or AES/EBU digital connection alongside an RJ45 port for a networked setup. You can, therefore, connect the speaker to an analogue preamplifier or a digital source such as a streamer or CD player. In the latter situation, the volume can be adjusted with an online app called Lanspeaker, which allows for full set up of this loudspeaker. There is another setup option on top of these which takes advantage of the 8c’s forthcoming Roon endpoint capabilities. Connect both speakers to your router or network switch and it’s possible to select them as Roon endpoints and send the signal directly from your library with no need for a DAC or preamplifier as both are built into the speaker. The power of DSP in this design is remarkable, allowing parametric EQ set up with remarkable precision and ease. When Ultimate Stream brought them down we put them at the recommended distance from the wall and used third party software (REW’s room EQ wizard) to measure the response at the listening position using a microphone plugged into a laptop. This shows where the peaks and troughs in the response are and by making a note of them you can adjust the response in Lanspeaker to produce a remarkably flat in-room result. The worse the acoustic character of the room, the greater the potential the system has to create an even result; fortunately the room I use is very even right down into the bass, but it was still possible to iron out a few dips and peaks by this method.